First cast with a couple of maggots on the hook and the float sank. A tiny rudd was the cause. Second cast, third cast, fourth cast all the same. After I don't know how many tiny rudd from just a couple of inches long to a bit bigger I was getting fed up of rebaiting so stuck an imitation maggot on the hook. It took a few seconds before the float sank this time, but the rudd was a little larger. I don't know how long this went on for, but soon a jack pike decided it would come out to play. Now I was losing fake maggots at a rate of knots as the greedy little beggar stole rudd from the end of the line. The colour of 'maggot' didn't seem to make much difference, although the red ones did take a little longer to get noticed. Or so it seemed. Getting a bite a chuck was fun for a while but when the fish are like peas in a bag from Birds Eye it soon becomes tedious. How people can get a kick out of it is beyond me. Eventually I struck into something heavier. At first I though the jack was back in action, but a large flash of brassy scales just before the fish buried itself in the marginal pondweed - and the float flew up a tree - told the true story. I'd hooked what I was after and blown it. That was the biggest fish I hooked all day. 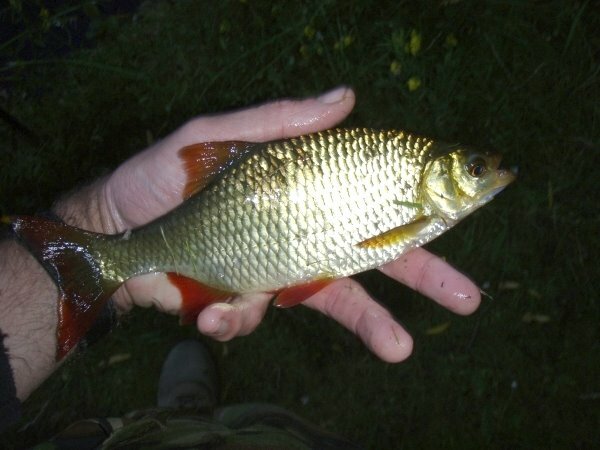 The evening saw me fishing corn on the hook and the average size of the rudd increased to what you might call 'bait-sized'. How many fish I caught during the day I really don't know, but it was a lot! 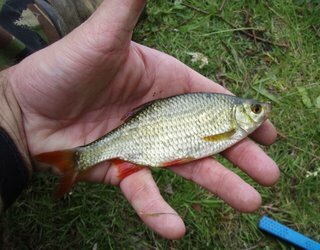 In amongst the rudd were a couple of perch (one taking a fake maggot), some roach (a couple nudging the pound mark) and a few hybrids (of varying degrees of rudd and roach). It was nice to do some float fishing (that wasn't for the sole purpose of providing pike baits) for a change. It quite took me back to my younger days fishing on the canal and local ponds, but one or two bigger fish would have made a pleasant day in the sun not just enjoyable but really satisfying. One thing's for sure, I'll never make a match angler. I don't think size fourteen hooks tied direct to five pound line would see me frame too often!